PPG free by Wolfgang Palm is a Mobile Audio App. 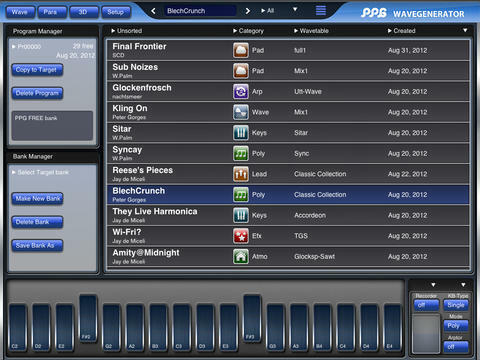 PPG free is a feature-limited version of the PPG WaveGenerator App. 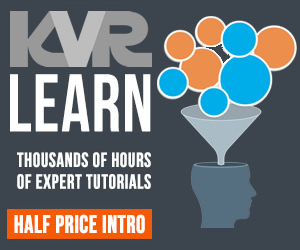 All editing functions are disabled, voice count is 5 maximum with a sample rate of 44.1kHz, but the user still has access to a selection of the library from the full version. 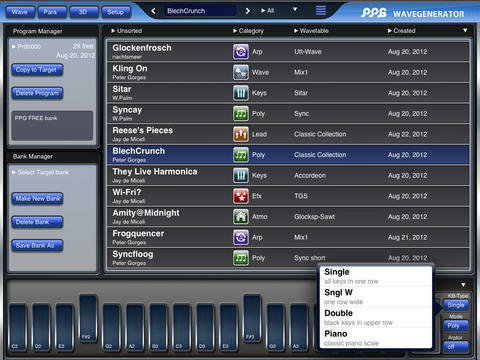 To benefit from the full power of the PPG synth engine users will need to purchase the PPG WaveGenerator App from the App Store. The PPG free comes with a multitude of wavetables. The sound material contains the typical sounds from the original PPG wave models, as well as many new sounds generated by versatile analysis tools and also hand edited waves. One way is to transform a picture into a wavetable. You can load photos from your album or even shoot a picture with the camera. In a 3D display you get a visual impression on how the sound evolves. You can turn around the 3D object and zoom in and out. The Parameters of the synthesizer are divided into modules. It contains 3 oscillators with independent control of pitch and waveform. Each oscillator has its own glide, which gives a very dynamic sound. PPG free benefits all advantages of the iPad, like X/Y control after the key on event, or two finder gestures for spectrum control. After a key is hit, the tone may be modified and modulated in various ways, just by moving your finger. 3D page, visualization of the wavetables, transformation from photos into wavetables. 256 waves assembled within a wave grid (Only editable in full version). 13 Envelopes, for independent control of pitch, waveform, filter and noise gain and panning (Only editable in full version). Arpeggiator (playback only in this version). Directly accessible context help inside the app. Use a camera, to shoot a picture and then transform it into a sound. (Only editable in full version). Using state of the art technologies, but still the versatile and efficient synthesis system.